This post was prompted by this blog about using the cranlogs package by Gabor Csardi. But my own interest as long time package developer dates back to this post by Ben Bolker. I like to see that my packages are being used. So I thought why stop at counting downloads and plotting the past. Why not predict into the future? The R language has seen steady growth over the past decade in terms of its use relative to other programming languages and the number of available extension packages, both reflecting increasing community engagement. 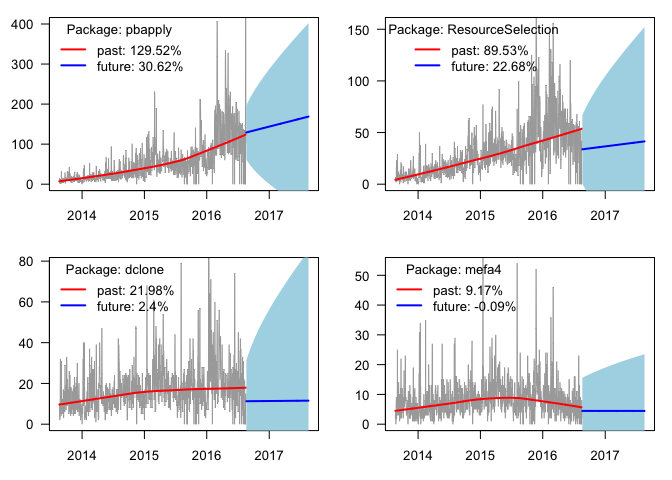 It is thus interesting to have a look at how individual packages perform over time based on CRAN download statistics. 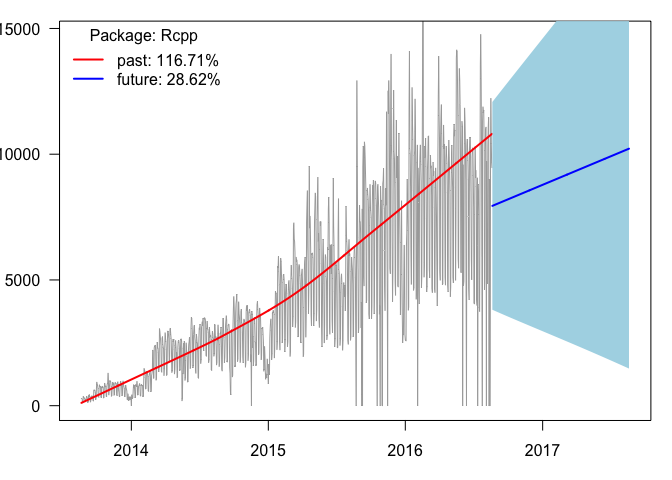 As the R user community expands, the disparity between more and less popular packages is expected to increase. A handful of packages are on top of the CRAN download chart harvesting most of the attention of novice R users. However, popularity and trending based on downloads is not necessarily the best measure of overall impact, more like a measure that is easiest to quantify. At least I like to think that 100 downloads with 10 users is way better than 100 downloads with a single user. These two scenarios are hard to tell apart though. So for now, let’s assume that download statistics reflect real impact. The increase is clear with increasing day-to-day variation suggesting that the log-linear model might be appropriate. Steady increase is predicted (the blue line starts at the last observed data point, whereas the red line is a locally weighted lowess smoothing curve on past data). The light blue 95% prediction intervals nicely follow the bulk of the zig-zagging in the observed trend. My approach as outlined here works for packages that have been with us since 2013. However, there are packages that went extinct (orphaned, excluded from CRAN, etc.) or appeared after 2013. These need to be handled with care when comparing across many packages or changing the time horizon. 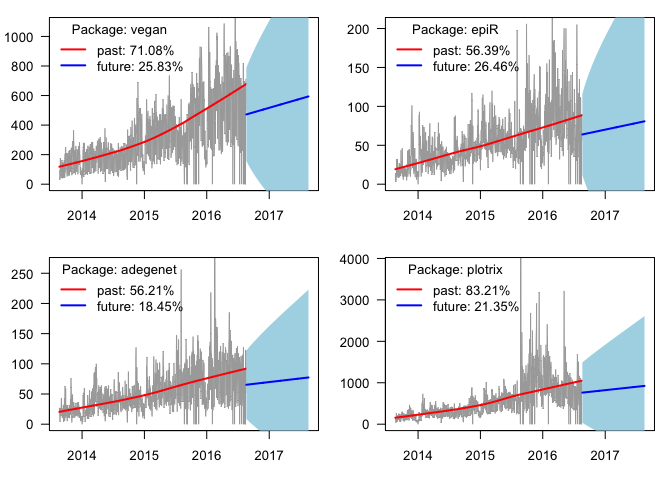 If you want to take the idea presented here a step further, you can compare observed and predicted increase in downloads for many packages, or compare recent download stats and trends. Let me know what you think in the comments below!